Cashing in on carbon — RandallAnthony Communications Inc.
Apart from the obvious environmental benefits of capturing and storing CO2, innovative companies in Canada and elsewhere are taking the process further by converting the gas into useful products ranging from construction materials and chemicals to agricultural inputs and animal feed. The International Energy Agency says carbon capture utilization and storage (CCUS) is one of the only suites of technology solutions that can significantly reduce emissions from coal and gas power generation and deliver the deep emissions reductions needed across key industrial processes such as steel, cement and chemicals manufacturing, all of which will remain vital building blocks of modern society. The good news is that Canada is already a world leader in the development and implementation of CCUS technology with nearly one-fifth of the 22 large-scale carbon capture and storage (CCS) plants operating or under construction around the world. 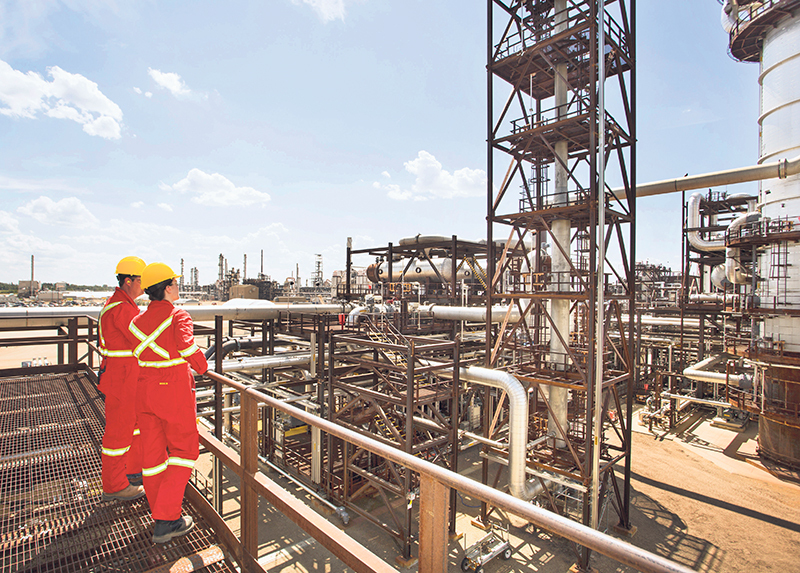 One of the largest is Shell’s Quest CCS facility, near Edmonton, which captured and safely stored 3 million tonnes of CO2 in its first three years of operations. And in Saskatchewan in 2014, the coal-fired Boundary Dam Power Station near Estevan became the first power station in the world to successfully use CCS technology to reduce GHG emissions by up to one million tonnes of CO2 a year, the equivalent to taking more than 250,000 cars off the road annually. Sandra Odendahl, president and CEO of Calgary’s CMC Research Institutes (CMCRI), which supports the advancement of technologies to reduce carbon emissions in large-scale industry, agrees that Canada is a global leader in CCUS. She points out that four of the top 10 global finalists in the $20-million NRG COSIA Carbon XPRIZE are Canadian. However, Ms. Odendahl says carbon utilization is likely to have no more than a modest impact on CO2 emissions for now, but will continue contributing to lowering the cost of carbon capture and – equally important – help Canada reach its GHG reduction targets. The latest CCUS fact sheet produced by CMCRI and the Pembina Institute in Calgary shows that by 2035, carbon utilization has the potential to store approximately 22 per cent of Canada’s annual GHG emissions, based on 2017 levels. This could generate $8.2-billion per year in avoided emissions alone at a carbon price of $50/tonne. Edmonton-based Capital Power, which generates electricity at 25 facilities across North America, has been working on CCS projects since 2004. Kate Chisholm, senior vice president, chief legal and sustainability officer, says CCS development is a valuable investment in the future, but focusing on CCUS technology offers the greatest returns economically and sustainably. For example, Capital Power has an equity interest in a company called C2CNT, which uses the CO2 captured from the stack at the Shepard Energy Centre, a natural gas plant in Calgary (jointly owned by Capital Power and ENMAX), and creates carbon nanotubes, which Ms. Chisholm says the lead project scientist has told her are stronger than steel, lighter than aluminum and more conductive than copper. Eric Beynon, who was a principal architect of the development of the Carbon XPRIZE competition, prefers to use the term “carbon-to-value” rather than “carbon utilization” when talking about converting captured CO2 into useful products. “This is going to be a strong economic play and an industry that I believe the world is going to need. Those leading and advancing the industry will have an economic advantage and reap some of the economic rewards,” he says. Mr. Beynon believes that while the carbon-to-value sector is gaining acceptance globally, more could be done to enhance public perception of its role as a viable way to CO2 reduction and an economic benefit. “We need to demonstrate that this is an innovation pathway that Canada should pursue, both as a means to address climate change and for longer-term economic development. Perception is an important first step, because if we can improve it, the structural elements, be they policy or funding, will follow,” he adds.